Ubud is well-known a for spirituality, yoga, art, rice fields and vegan food! And the monkeyforest, with three old temples and 600 monkeys. But this post is of course about food. The theme of these post is; Keep them rollin’! Wraps, spring rolls and rolls! Vermicelli noodles, cucumber, carrot, mint, radicchio lettuce and chicken. Served with Hanoi sauce. A fresh, light meal with a lot of flavors. A good lunch! A was eating lunch at Habitat, which is across Monkey Forest and next to the co-working space Hubud. A good place for a drink and have lunch. Lunchtime @ Hubud – a co-working space in Ubud. A very refreshing vegetarian with different vegetables and a slightly spicy peanut sauce. Filled with mushrooms, spinach, ginger and tofu. Served with two sauces, a soja sauce and a sauce of lemongrass. The tofu in it was good, a very good structure and a good bite. Because of the spinach the taste was a bit watery. Old ancient Indonesian drink made with spices like tamarind and Turmeric. It helps by digestion problems, had anti-oxidants and it helps to lower pain in joints. 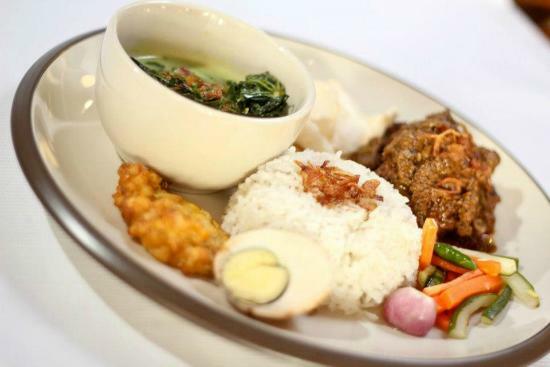 A traditionally dish from West Java, but loved in other places in Indonesia. Slow cooked beef in a sauce of coconut milk and lemongrass. A very good dish at a nice restaurant. Funny fact; the sell a lot of the products in the restaurant, like lights, cabinets and mirrors.